These ingredients yielded about four 2-cup bowls. Okay, let’s begin! 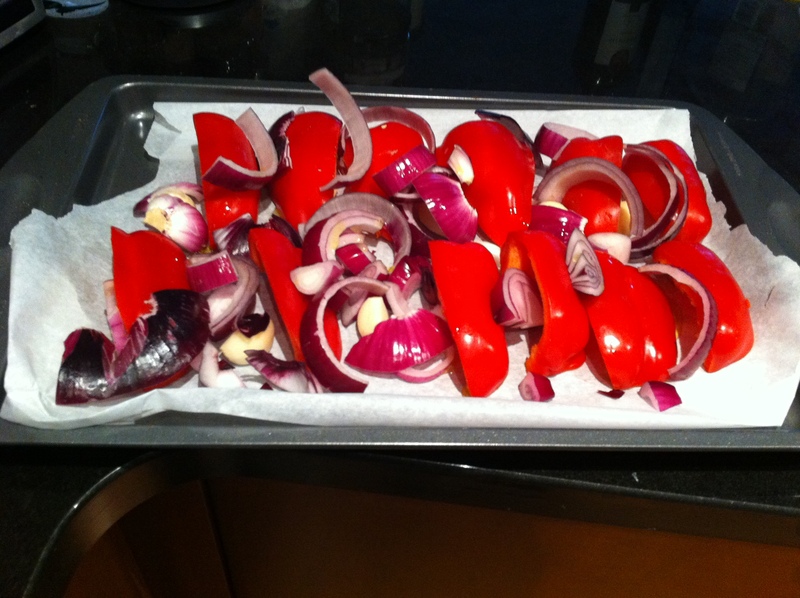 I cut the red peppers in quarters and placed them on a cookie sheet (skin side up) lined with parchment paper. I also threw on the sliced-up onion and garlic cloves. I drizzled them with olive oil. 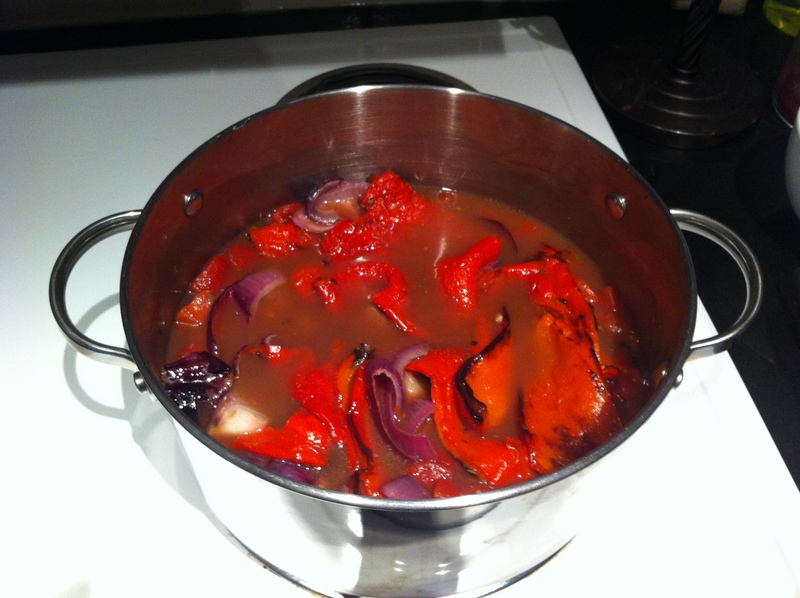 The original recipe calls for 1 tablespoon of it – I just put on as much as I thought necessary. I put them in the oven that was preheated at 400 °F. I had to leave them in for a longer time, however. The garlic and onions were browning up to the extent I wanted to over the 20 minutes, but the red peppers weren’t making very good progress. I removed the onions and garlic and left the red peppers to bake for close to an hour … or maybe 45 minutes, something like that. I also had to jack up the temperature to about 420 °F. After that was done, I put the peppers in a cold bowl of water to stop them from cooking and to also make removing the skin more manageable. I peeled off as much of the skin as I could. At that point, I felt they the peppers could benefit from some more roasting, so I threw them back in the oven for about 20 minutes. 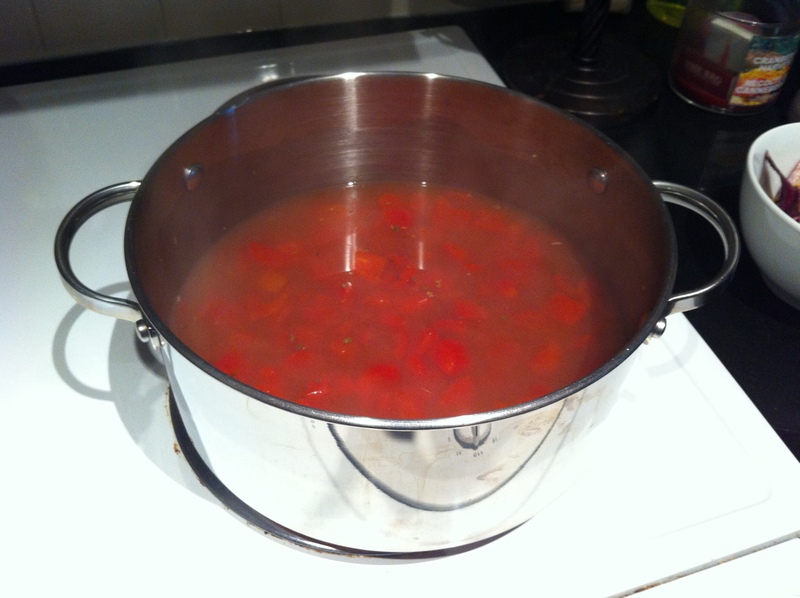 While all that business was going on, I had the tomatoes, oregano and chicken stock on the stove. I brought the concoction to a boil, then down to a medium simmer, a 3 on the dial. After a minute, I brought the roasted constituents to the party. I covered the pot, let them all simmer down for about 10 minutes, then turned off the heat. Now it was time to puree the whole thing. 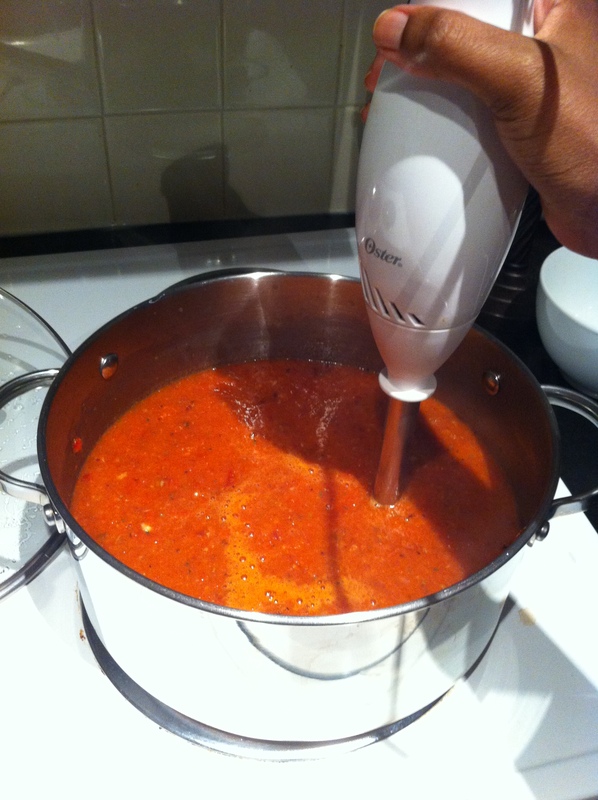 I broke out my trusty immersion blender and it did the trick. At this point, I added the sugar, salt, black pepper and basil. You might have noticed that I didn’t specify the quantity of basil in the ingredient list. This is because I’m not a fan of measuring, as you all know. Plus, I think basil is the best herb ever, so I would tend to put more in than the next person. I probably put about 8 or 10 sprigs’ worth. Anyway, I stirred all this stuff up. I waited about 10 minutes to let the bisque cool down a scosche. At that point I added my half & half. The original recipe asked for heavy cream. While I would eat almost anything with heavy cream at a restaurant, I could never actually add heavy cream into anything I made myself. It’s just one of those weird things, I suppose. Plus, I already had half & half for my coffee, so I thought I would just use that. Seconds after adding the milk/cream mixture, some unattractive curdling action occurred. I was kind of grossed out at first – the thought of curdled milk in coffee or cereal instantly makes my skin crawl. But at the same time, I thought to myself “I’ll be damned if I throw out this meal I spent so much time making because of some little white pieces!” I did some Googling, and as I suspected, the curdles posed no danger. It was a mixture of the milk, the heat and the acidity of the tomatoes that caused all this to happen. In any event, it blended pretty well into the soup, so it wasn’t very noticeable. 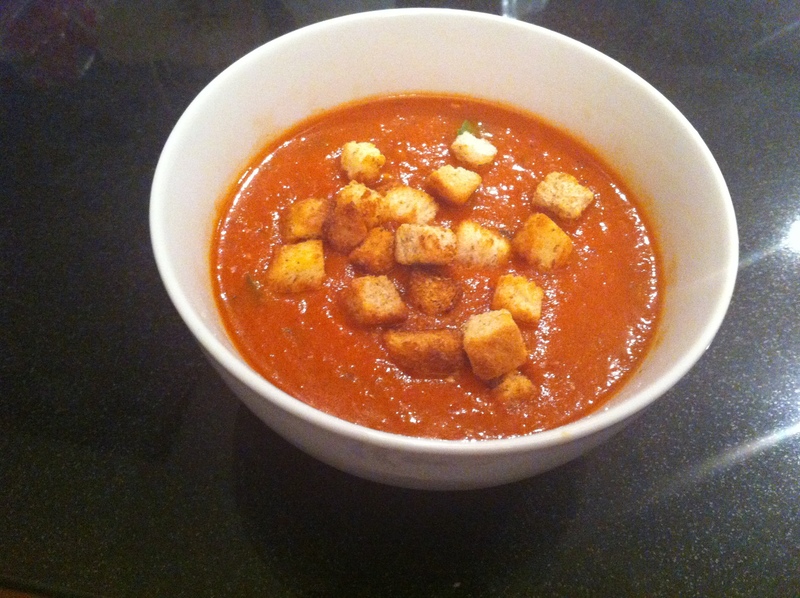 I poured myself a bowl and added a handful of croutons for the finished product. I must say I was impressed by my creation. Perhaps next time I might add some more garlic and onions, maybe even a little ginger too. I’ll probably double-up on everything, so I have plenty to freeze and eat for later, because it was pretty tasty! This bisque is definitely hearty and will be a staple in my fall diet. I suggest it to all!